In this new volume of ARQ DOCS, Rahul Mehrotra presents his concept of Kinetic City, a form of operation arising from his work in Mumbai, India, which allows us to see the city as a dynamic entity in constant movement and also gives us variables to work in those contexts. 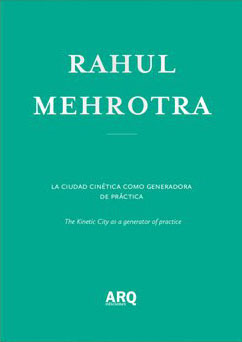 This text is supplemented by a conversation between Mehrotra and renowned Spanish architect-and director of the Department of Architecture at Harvard Iñaki Abalos, who explores Mehrotra’s career and the way in which he dissolves the boundaries between the binaries that architecture accustomed. The book also features forewords by Solano Benitez and Felipe Vera.